The Strategic Initiative for Developing Capacity in Ethical Review – Forum for Ethical Review Committees in the Asian and Western Pacific Region (SIDCER-FERCAP) awarded its recognition to MDH-IRB during the 13th FERCAP General Assembly in Bali, Indonesia on November 20, 2013 for compliance to ICH Guidelines, GCP standards, CIOMS Guidelines, WHO Standards for Operational Guidance for Ethics Review and Health-related Research and Surveying and Evaluating Ethical Review Practices, EC/IRB Standard Operating Procedures, and Local Regulations and Standards in Ethical Review. The SIDCER-FERCAP renewed its recognition to MDH IRB on November 23, 2016 at the BhumiSiriManglanusorn Building, King Chulalongkorn Memorial Hospital. MDH IRB is one of the founding members of the Philippine National Health Research Ethics Network (PHREN) established in 2013. The International Council on Harmonization (ICH) defines an institutional review board (IRB) as a group formally designated to protect the rights, safety and well- being of human beings involved in a clinical trial by reviewing all aspects of the trial and approving its startup. IRBs can also be called independent ethics committees (IECs). The Manila Doctors Hospital uses the term IRB to represent its institutional review board. The Manila Doctors Hospital-institutional Review Board (MDH-IRB) does not only review the ethical aspects of a research protocol but also the informed consent process, participant recruitment, advertisement, research staff suitability and risk-benefit balance. It operates in accordance with national and/or local regulations as well as with ICH-Good Clinical Practices (GCPs) guidelines. The Manila Doctors Hospital Ethics Review Board (MDH-ERB) was officially created in 2000 as an arm of the Committee on Research (CORES) and functioned to review and document approvals of all clinical researches conducted at the Manila Doctors Hospital. Before that time, there were no records of the activities of the MDH-ERB or any functioning body in the hospital. ERB functions were simply an additional responsibility of the Committee on Research and/or the Hospital Ethics Committee. The Philippines General Hospital ERB guidelines served as the basis for the review process. In 2007, the MDH-IRB was registered as an established review body by the Philippine Council for Health Research Development Board (PCHRD). 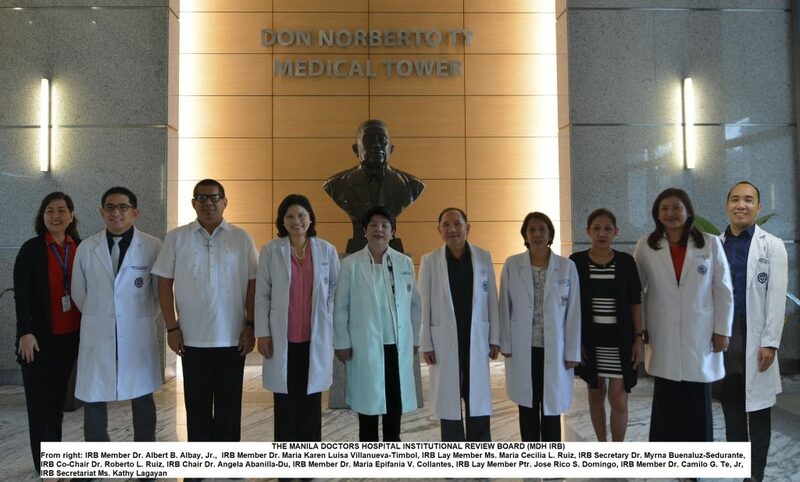 Two years later, the ERB was renamed the Manila Doctors Hospital Institutional Review Board (MDH-IRB). The MDH-IRB reviews researches conducted by hospital and medical staff, residents, fellows and other trainees of the Manila Doctors Hospital (MDH). Majority of its workload comes from review of industry-sponsored clinical trials by principal investigators who are consultants of the Manila Doctors Hospital. The MDH IRB has been granted Level III Ethics Review Committee Accreditation effective March 14, 2014 until March 14, 2017 and has been re-accredited and granted Level III Ethics Review Committee effective March 14, 2017 until March 13, 2021. The MDH –IRB has been granted recognition by the Strategic Initiative for Developing Capacity in Ethical Review – Forum for Ethical Review Committees in the Asian and Western Pacific Region (SIDCER-FERCAP) last November 20, 2013 in Bali, Indonesia. SIDCER-FERCAP renewed its recognition to MDH IRB on November 23, 2016 at the BhumiSiriManglanusorn Building, King Chulalongkorn Memorial Hospital. Currently, the MDH IRB is one of the founding members of the Philippine Health Research Ethics Network (PHREN). A clinical trial is any research study that prospectively assigns human participants or groups of humans to one or more health-related interventions to evaluate the effects on health outcomes. Interventions include but are not restricted to drugs, cells and other biological products, surgical procedures, radiological procedures, devices, behavioural treatments, process-of-care changes, preventive care, etc. How do we submit clinical trials for review? Good Clinical Practice (GCP) Training Certificate of Principal Investigator (PI), Co-Investigator (Co-I) and the research coordinators of the study team (for clinical trials); On-line GCP is accepted if submission is for renewal. For revised study protocol of Hospital and MDH medical staff: In case of major changes in the protocols deviating from the original, the PI should state that the research is a different version from the previous one and the new paper must be accompanied by all the documents required in Additional Basic Documents for Hospital and MDH Medical Staff Study. 1. How long does it take for MDH IRB to approve a protocol? The MDH IRB approves a reviewed and deliberated protocol after the IRB meeting date set every last Tuesday of the month, or otherwise declared, and releases its approval/query letter 1 to 5 days after the said IRB meeting. Turnaround time from submission to approval is usually around 2 to 3 months. 2. How many copies of the protocol should I submit? Six (6) copies of the protocol package for review and approval should be submitted on or before the cut-off date which is every 15th of the month. 3. How long is the validity of the ethical clearance? The validity of the ethical approval is for one (1) year only, hence, the Principal Investigator should apply for a Continuing Review. 4. Do we pay for storage of clinical trial drugs? Storage of clinical trial drug and other expenses are not included in the review fee. There should be a separate agreement with the MDH Pharmacy or the Committee on Research (CORES) for storage. 5. When do we pay ethics review fee? Upon submission of the protocol, otherwise, it will not be reviewed. 6. Who prepares the CTA? The IRB is NOT a signatory of the CTA. The CTA undergoes IRB endorsement prior to approval of the Hospital Director.